There is a somewhat common argument in the guitar playing community on whether one should learn to play using alternate picking (strict up/down strokes all the time) or directional (also referred to as economy or sweep picking). Just to be clear, let me explain what I mean when I say “directional picking”. If you were to play a major scale using 3 notes per string, directional picking would call for you to play down/up/down on the first string followed by DOWN/up/down on the next (higher in pitch) string, followed by DOWN/up/down again on the next higher string and so on. As you see 2 down strokes are performed consecutively when changing strings. If strict alternate picking was to be used, the player would pick down/up/down all the way through the scale. If you were to descend the scale using directional picking, you would play up/down/up, UP/down/up, UP/down/up and so on. Again notice that when you cross strings you perform 2 of the same pick strokes in a row. Let’s examine the above points more closely. The first argument was that strict alternate picking leaves you more free when improvising since the motions become automatic. Well the reason why the motions FEEL automatic is because your muscles remember ANYTHING they do enough times and are able to automatically execute whatever they have been trained to do. If you were to take the trouble to relearn your picking technique, the new motions will eventually become so ingrained in the muscle memory that they will become natural as well. Directional picking when approached correctly is simply the most logical way to pick. In school we were taught that the shortest distance between two points is a straight line. With directional picking we use the straight line approach to minimize the motion that is needed to get to the next required note. When you see the string you are going to play next, you go DIRECTLY to it (hence the name for the technique). There is no need to memorize predetermined picking patterns. Once you master the technique, you will be able to execute extremely fast lines without much thinking at all. The result? Since less motion is required for the pick to travel to the same destination brings greater speed, accuracy and flow. Moreover, with the extra motion that is involved with alternate picking (that is required to cross over the string to maintain the constant down/up/down motion of the hand) puts extra strain on the muscles and makes you more likely to get injured. Why would anybody want to compromise their own playing ability? Moving right along, lets look at the second argument. Some people claim that directional picking disrupts the rhythm and the precision (articulation) obtained by alternate picking. Interesting. 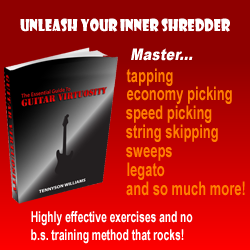 When one takes a look at guitarists such as Tom Hess, Mike Walsh, George Bellas, Ney Mello, Chris Kalkbrenner, Frank Gambale or Jimmy Bruno (all extremely high caliber virtuoso players who use directional picking), it is obvious that their playing is always incredibly metrical and precise with no loss of rhythmic control whatsoever. The reason why players tend to believe the argument against directional picking is because the technique can be tricky to learn correctly, but once mastered results in much greater ease of playing and greater speed. The challenge of directional picking lies in training the forearm stability to correctly stop the pick when needed. This requires a great deal of strength of the stabilizing muscles of the forearm which must be developed through special training. Most players never take the time to master the technique properly and this leads to loss of control in playing. When I say that this technique is more efficient than alternate picking I am not saying that it is much easier to learn. The point that I am trying to make is that this technique gives you greater results per amount of time spent (then alternate picking). As with anything, I cannot overemphasize the need for a great teacher who can explain and teach the technique well. Another common argument is that if the vast majority of guitar virtuosos such as Rusty Cooley, John Petrucci and Paul Gilbert and Michael Angelo use alternate picking with such success why would anyone bother learning directional picking?. When looking at these players it immediately becomes obvious that alternate picking can be and is being used with tremendous results. So what is going on here? I am not discrediting alternate picking. It is obvious that it can bring great results. However it takes a LONGER time to master alternate picking (than it does directional picking) due to excess movement that the technique requires. Moreover, it is not as ergonomically efficient thus increasing the risk of possible injury. However it is entirely possible to become equally fast using both techniques. The question is: how much time do you wish to spend developing your technique? Now I can hear people ask: then why do the majority of guitar players use alternate picking if it is less economical? This is a valid question and I think that the reason for this is because of certain traditions and conventions that have been followed in guitar playing through the years. However, as in any other science (and guitar technique is a science that obeys the laws of physics- this is of course entirely different from the art of making music) certain advancements are continually being made. The discovery of directional picking proves that. It is already being used by players with great success. Guitar technique is still in its early stages of development (I mean do you realize that electric guitar is less than 100 old?) therefore it is only natural that new discoveries in areas such as technique will occur. 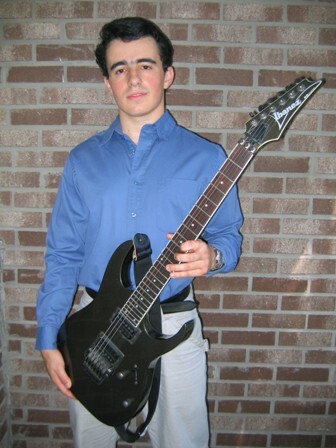 Speaking from personal experience, I actually (when I first began playing) started out intuitively using directional picking because I was self taught for the first year that I played. When I got my first teacher, he told me that I was picking “incorrectly” and I switched to alternate picking for about two years. Then when I realized the advantage of directional picking I switched my technique again (for the second time) and now I use directional picking almost all of the time with great success. I can also testify to the fact that directional picking felt very natural to me when I first learned it on my own, and later alternate picking felt just as natural when I changed my technique for the first time. Now that I have changed to directional picking for the second time it feels more natural than ever. Hopefully this article opened up your eyes to a new technique that you may not have considered trying out before.